George Everette Day was born in Sioux City, Iowa on February 24, 1925. In 1942, he dropped out of high school and enlisted in the Marines. He served two and a half years in the South Pacific during World War II. After the war, he earned a Bachelor of Science degree, attended law school and passed the bar, before returning to active duty in 1951 where he completed pilot training and flew two tours in the Korean War. He miraculously survived a “no-chute” ejection in 1955. At 43, Day volunteered for duty in Southeast Asia. On August 26, 1967, he was shot down by ground fire over North Vietnam. While ejecting from his airplane, he received several injuries. Day was captured, beaten and tortured. After five days, he escaped, traveling over 25 miles despite his many injuries. Over a week later, only a short distance from a U.S. Marine base, he was tragically recaptured by the Viet Cong and was again severely beaten and tortured. He was taken to the infamous “Hanoi Hilton,” where for five and a half years Day endured agonizing treatment. In 1973, he was finally released. He retired from active duty in 1976. 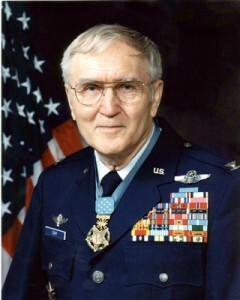 Colonel Day has been awarded the Medal of Honor, the Air Force Cross, the Purple Heart with three Oak Leaf clusters, the Distinguished Service Medal and the Silver Star, as well as over sixty-five other honors. Following his retirement, Colonel George Day returned to practicing law, often fighting for veterans rights. He has written two autobiographical books, Return with Honor and Duty, Honor, Country. He lives in Shalamar, Florida with wife, Doris, his childhood sweetheart.